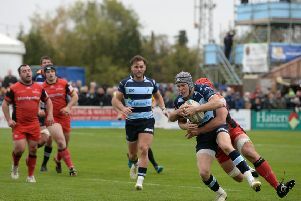 Bedford Blues have announced that a further four members of the current squad have put pen to paper on new deals to remain at Goldington Road next season. Back rower Ben Adams, lock Will Carrick-Smith, scrum half Jordan Burns and centre Ollie Dodge have all signed new contracts, joining Ben Cooper and Michael Le Bourgeois who re-signed again last month. Blues director of dugby Mike Rayer told the club’s official website: “It’s great news for the club that these four lads have signed new deals. “They all been very consistent and durable in what they’ve produced this season. “Will is getting better and better as the season goes on, Ben has now adjusted to the physicality of the championship, Jordi has once again lit up our attacking play and there is more to come from him. “And Dodgey, well what can you say, he just keep delivering exactly what it says on the tin! Blues are without a league game this weekend, while they host Aviva Premiership side Northampton Saints on Friday, March 17, after they agreed to fill the void in the fixture list following the recent demise of London Welsh.